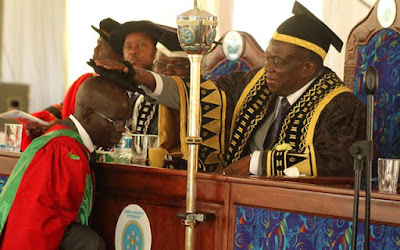 President Emmerson Mnangagwa yesterday capped 1 218 graduates at Chinhoyi University of Technology (CUT)’s colourful 13th graduation ceremony. The conferment of degrees was preceded by the installation of President Mnangagwa as the Second CUT Chancellor, his first role as the chancellor of all State universities. CUT Vice Chancellor Professor David Simbi, who presided over the installation, said as academia, they would diligently serve the country. The graduands were drawn from seven institutes, with 60 of them having first-class passes. There were 163 masters degrees and seven Doctor of Philosophy (PHD) degrees. Prof Simbi bemoaned the low number of PHD graduates, which he said should correspond with the high number of qualified staff at the university. “Given the number of PHD holders among the teaching staff, it is our belief that the number of students graduating with Master and Doctor of Philosopy is too low given the university’s academic standing,” he said. There are 65 senior lecturers with PHD qualifications and nine associate professors and 13 full professors. He said with a well-defined research agenda targeting the value addition cluster of Zim-Asset, the academics at CUT had the ability to produce more in creative, innovative prototype technologies and engineering products. University Council chairperson Dr Obadiah Moyo said President Mnangagwa’s presidency signalled a new era in the country’s socio-economic and political direction. Students Representative Council president Nesbert Bhonzo said students were optimistic that the country’s socio-economic fortunes would change under President Mnangagwa’s leadership. Most of the students interviewed said they expected Government to create jobs and opportunities that will help them express themselves in creating wealth. A carnival atmosphere engulfed the marquee as the graduands and those in attendance took every opportunity to express their joy. Musical and poetry interludes heightened the excitement. As has become the norm at gatherings graced by President Mnangagwa, the DJ did not miss the opportunity to play Jah Prayzah’s hit songs “Kutonga Kwaro” and “Mudhara Vachauya”. Poet Tatenda Chinoda gave a spell-binding performance that left the expectant crowd eating out of his palm, particularly with a rendition of his poem on contemporary political and economic realities.